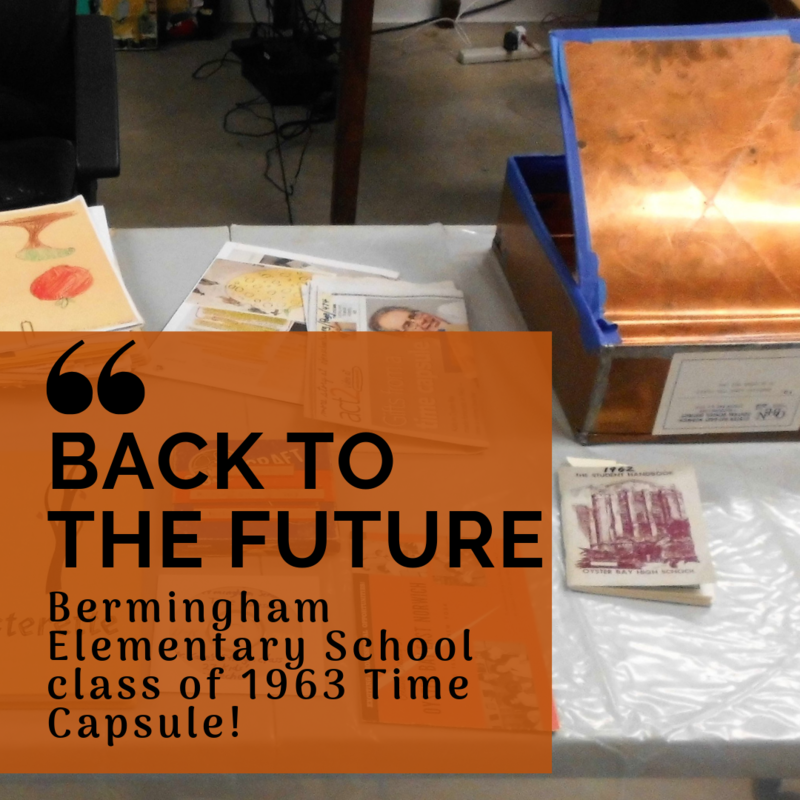 ​On Saturday, September 22nd we welcome retired teacher, Richard Siegelman as he takes us back to 1963 to view the contents of a time capsule buried by the Bermingham Elementary School class of '63. You're invited to join us from 1-3 PM as he shares the letters, drawings, and photos of students who pondered what life would be like in the year 2000. ​We invite previous students from the Bermingham Elementary school to attend and view their work and share with us their thoughts on what they believe it would be like in the year 2000 and if any of their thoughts have become reality. The program is $5 for members and $10 for non-members. ​John Hammond, Oyster Bay Town Historian and published author is scheduled to host a historic walk throughout the hamlet of Oyster Bay. The tour will begin promptly at 2:00 PM from the Earle-Wightman Historic House. ADVANCE REGISTRATION IS REQUIRED AND PLEASE ARRIVE 15 MINUTES PRIOR TO DEPARTURE. For more details, or to make a reservation, contact the Society at (516) 922-5032 or e-mail us at obhsdirector@optonline.net. "In the Eyes of the Beholder: The Connection Between Art, Nature, and Community"
Join us on Thursday, September 20th from 5 - 7 PM at the Angela Koenig Center to say farewell to this well-received exhibit of the various areas in and around Oyster Bay. 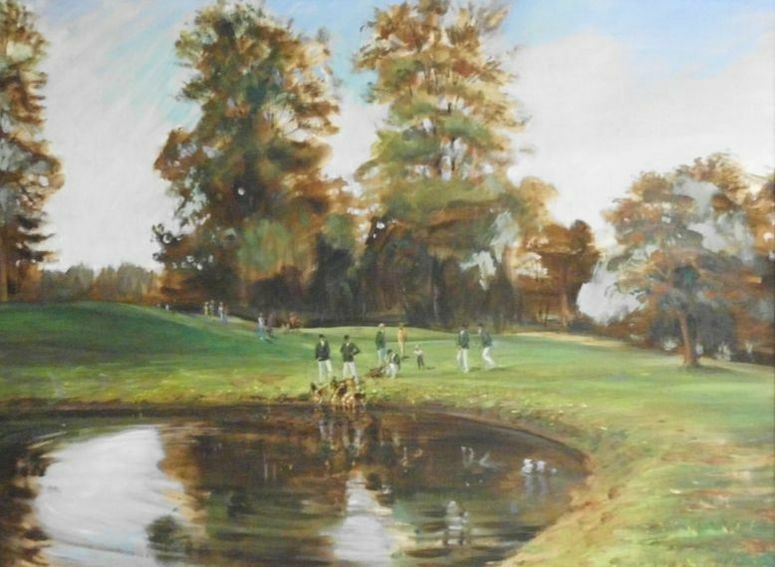 ​On view from June to October 2018, the Oyster Bay Historical Society’s new exhibition, “In the Eyes of the Beholder: The Connection Between Art, Nature, and Community", is the fruition of a collaborative partnership between the Society and Adelphi University’s Bridges to Adelphi program. The paintings, drawings, and photographs on display were created by this talented group of students inspired through their own interpretations of the natural sites within the Town of Oyster Bay. The exhibition will also feature special selections from the archives to complement the artwork, merging together both the past and present alternate views on how nature is perceived and viewed through many eyes. Bridges to Adelphi, located on Adelphi University’s campus in Garden City, NY, enables students who are on the autism spectrum or have nonverbal learning disabilities make a smooth transition to university and postgraduate life. The program offers individual and group academic, social, and vocational support services. LEARN ABOUT HISTORIC OYSTER BAY, THROUGH OUR LEISURELY WALKING TOURS CONDUCTED BY OYSTER BAY TOWN HISTORIAN & PUBLISHED AUTHOR, JOHN HAMMOND. SUNDAY JULY 29TH AT 2PM., SHARP! PLEASE ARRIVE 15 MINUTES EARLY TO REGISTER OR REGISTER IN ADVANCE VIA PHONE, OR EMAIL. THE TOUR WILL BEGIN AT THE EARLE-WIGHTMAN HOUSE, 20 SUMMIT ST. OYSTER BAY. Closing Reception - "Conservation from Here"
Join us for our closing reception honoring "Conservation from Here" Thursday, June 7th, 2018 at 4:30 pm in the Angela Koenig Gallery. Come meet the exhibition's artist, Joseph Rossano, and hear a special presentation by Cristina Marco-Fernandez of Cold Spring Harbor Laboratory on the Long Island DNA Barcoding Project. Join Howard Ehrlich, of the Theodore Roosevelt Association, and Denice Evans-Sheppard, Executive Director, on a foot tour around Oyster Bay, featuring the historical sites along East and West Main Street, Audrey Avenue, and South Street in the heart of the hamlet. Interaction among members of the tour always welcome. Leisurely weekend pace. The tour will begin at 2:00 pm. Registration is $20 per person, $5 for ages 12-17, free for children under 12. Participants should arrive 15 minutes early to check in and pay prior to the tour. For more details, or to make a reservation, contact the Society at 516-922-5032 or email obhsdirector@optonline.net﻿. In honor of New York State Conservation, the Oyster Bay Historical Society has decided to engage in a special Sacred Sites Tour. The tour will start at the EW Historic House. The trolley will depart from the Earle-Wightman house at 1:00 pm. Refreshments and historical handouts will be distributed on the trolley. The tour will be $25.00 per person and $15.00 per child. Advanced registration is required and it is strongly recommended that registrants arrive 15 minutes prior to the tour to pay the registration fee. The first stop will be at the Young's Cemetery with an overview of the resting place of President Theodore Roosevelt and others interred at the cemetery. Linda Bruder, Oyster Bay Cove Historian will share historical information regarding this site and other residents the Oyster Bay Cove community. The second stop will be the Christ Church with Howard Ehrlich of the Theodore Roosevelt Association. Howard will be providing a historic overview of the Church's past and present. A tour has been prepared to visit the inside of the church and view the pews that Theodore Roosevelt and family once sat in. The third stop will be the Pine Hollow Cemetery. Denice Sheppard, Executive Director of the Oyster Bay Historical Society, will be discussing the historical overview of the cemetery property. She will share a photo of previous owner John Weeks, and discuss the historical significance of the cemetery and Hood AME Zion Church, Civil War Soldiers with the GAR Markers. The trolley will then return participants to the Oyster Bay Historical Society. For more information, please contact obhsdirector@optonline.net or 516-922-5032. Dates for future walking tours to be announced soon! Our walking tours are back! 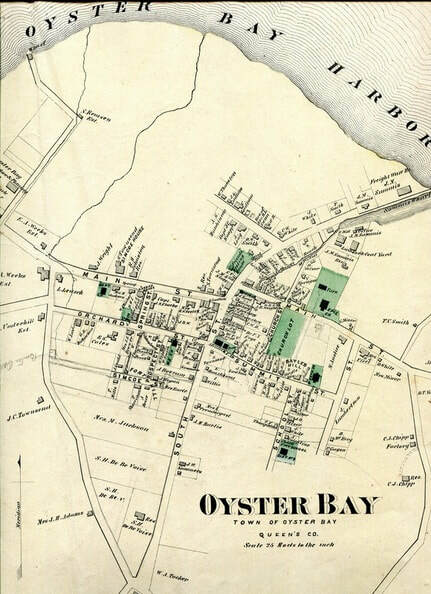 Join Oyster Bay Town Historian, John Hammond, on a foot tour around Oyster Bay, featuring the historical sites along East and West Main Street, Audrey Avenue, and South Street in the heart of the hamlet. Interaction among members of the tour always welcome. Leisurely weekend pace. The tour will begin at 2:00 pm. Registration is $20 per person, $5 for ages 12-17, free for children under 12. Participants should arrive 15 minutes early to check in and pay prior to the tour. For more details, or to make a reservation, contact the Society at 516-922-5032 or email obhsdirector@optonline.net﻿. The focus of this presentation is the recent donation of historical documents to the Oyster Bay Historical Society. These papers, awards, and photographs highlight Mary Marshall’s 65 years of preserving the history of these African American families and participating in the 20th century life of Oyster Bay. Mary’s broad collection chronicles these families leaving the Jim Crow South, and eventually working for, and later with, some of the civic and political leaders of Oyster Bay of that era, regardless of social status, ethnic origins, economic disparities, or religious affiliations. Monet Jackson-Rothenberg, of Oneonta, NY, is the granddaughter of Mary Tankard Marshall. She meticulously assembled and prepared her grandmother’s preserved records, photos, and newspaper clippings dating between 1918-1988, which were generously donated to the historical society in early April. It is her hope that others will study this microcosm of the forces behind the Great Migration of African Americans from this particular part of the South to the particular place in North America. Learning the necessary steps to research your family lineage through Ancestry.com. The "SEEKERS", a historical research group will show the necessary steps of conducting and documenting various sources for future historical preservation. Learning how to trace your ancestral lineage through wills, deeds and quilts. Join us this Saturday for an informative discussion on "Invisible People of Color: Whaling Captains & Crews"
Our guest speaker, Sandi Brewster-Walker, will discuss the genealogical and historical research she undertook to learn about these individuals, who hunted whales during the peak years of the thriving industry (1840-1860). Along with being a historian, author, and businesswoman, Sandi also served as the Deputy Director of the Office of Communications in the United States Department of Agriculture under the Clinton Administration. Price for admission is $5.00 for members and $10.00 for non-members. Non-members are welcome to sign up for membership prior to the program. Advance registration is kindly requested. We look forward to seeing you there. Private Journal of Charles Wightman. Personal documents play an important role in how historians learn about the past. Through personal accounts such as diaries, account books, and correspondence, we gain greater insight into the day-to-day lives of ordinary people. In Read between the Lines, we utilize specific first-hand documents written by three housekeepers who once lived in Oyster Bay. The exhibition presents primary texts from Mary Cooper’s late-colonial diary (1768-1773), Marmaduke Earle’s school-house account books (1802-1844), and Charles Wightman’s private journal (1883-1884). 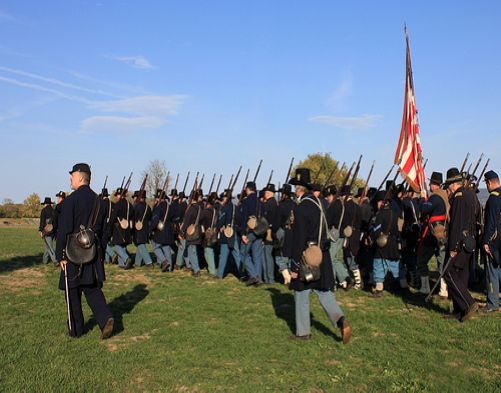 On February 24th, 2018 at 3:00 pm, the Oyster Bay Historical Society will host in the Angela Koenig Center gallery three authors for an honest and open conversation regarding our Town’s soldiers who served in the Civil War and the obstacles and adversities they had faced upon their return home. Book signing and refreshments will immediately follow. The program is $5.00 for current members of the Oyster Bay Historical Society and $10.00 for non-members. Advanced registration is required. To register, please call 516-922-5032 or email obhsdirector@optonline.net. Bill Bleyer: For thirty-three years, Bill Bleyer worked as a prize-winning staff writer for Newsday before retiring in 2014. He is the author of Sagamore Hill: Theodore Roosevelt's Summer White House and co-author of Long Island and the Civil War, both published by the History Press. John Hammond: John E. Hammond is the official historian of the town of Oyster Bay, where his ancestors settled in 1653. 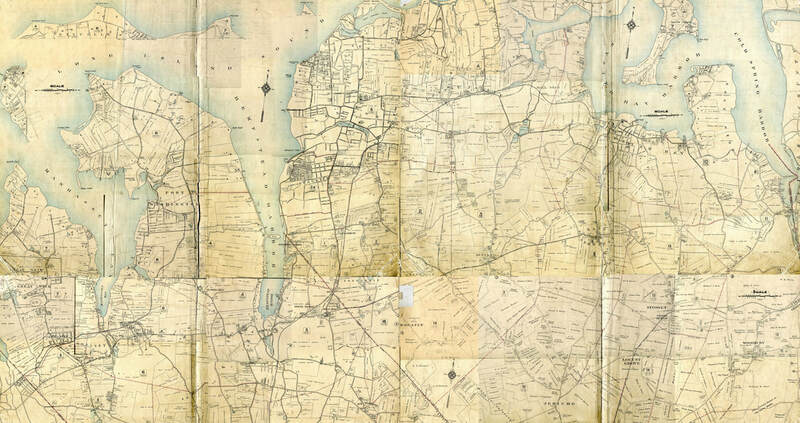 Using images from the author's own collection, as well as from the Oyster Bay Historical Society, Sagamore Hill National Historic Site, and private collections, Oyster Bay chronicles the history of the hamlet in the late 19th and early 20th centuries. Francis Carl, Jr.: Francis S. Carl is the great-great grandson of David Carll of Oyster Bay. Francis has been on a mission to research his great-great grandfather who served in the 26th United States Colored Troop Regiment from New York. Francis and his cousin, Denice Sheppard had recently co-authored, "Footsteps of A Forgotten Soldier," The Life and Times of David Carll. Please join us for a delightful concert of song and praise at the A.M.E. Hood Zion Church on Saturday, February 10th, 2018, at 3:00 pm, with Gospera featuring June Townes. The event, sponsored by the Oyster Bay Historical Society and Hood A.M.E Zion church and is free for current members of the Oyster Bay Historical Society and a $10.00 cover charge for non-members. Advanced registration is required. To register, please call 516-922-5032 or email obhsdirector@optonline.net. June E. Townes & Gospera is a music ministry dedicated to spreading the Christian gospel through song and the preservation of African American spirituals, hymns and the sacred anthems of the church. This small ensemble of talented singers lead by Ms. June E. Townes is a unique performance ministry that not only touches the soul and feeds the spirit but also educates the mind. Did you know Ed Norton, The Simpsons and Gracie Allen are all connected to Oyster Bay? at our unique trivia challenge. Bring your own foursome Trivia Team or just come on your own and watch the fun!